It’s tempting to think that we live in an unprecedentedly fertile age for conspiracy theories, with seemingly each churn of the news cycle bringing fresh manifestations of large-scale paranoia. But the sad fact is that these narratives of suspicion—and the delusional psychologies that fuel them—have been a constant presence in American life for nearly as long as there’s been an America. In this sweeping book, Thomas Milan Konda traces the country’s obsession with conspiratorial thought from the early days of the republic to our own anxious moment. Conspiracies of Conspiracies details centuries of sinister speculations—from antisemitism and anti-Catholicism to UFOs and reptilian humanoids—and their often incendiary outcomes. 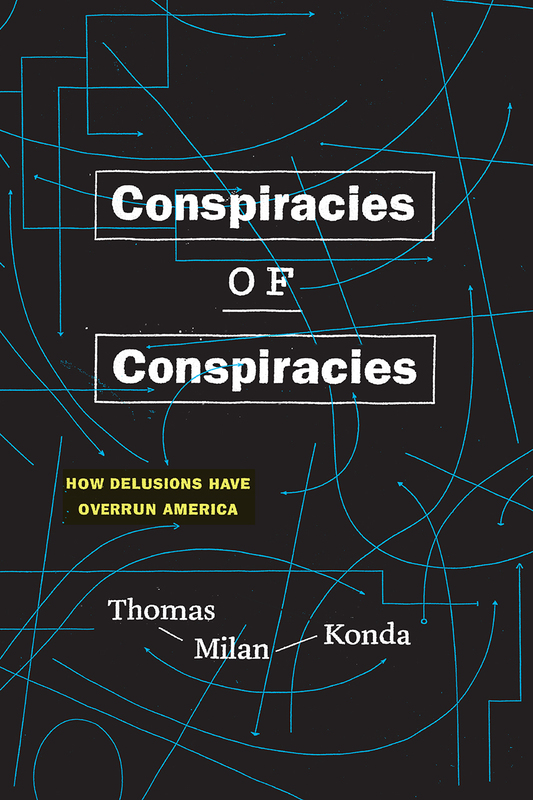 Rather than simply rehashing the surface eccentricities of such theories, Konda draws from his unprecedented assemblage of conspiratorial writing to crack open the mindsets that lead people toward these self-sealing worlds of denial. What is distinctively American about these theories, he argues, is not simply our country’s homegrown obsession with them but their ongoing prevalence and virulence. Konda proves that conspiracy theories are no harmless sideshow. They are instead the dark and secret heart of American political history—one that is poisoning the bloodstream of an increasingly sick body politic. “Conspiracies of Conspiracies is clearly written and deeply researched, a fine-grained account of American conspiracism from the earliest years of the Republic to the present day. There is scarcely a manifestation that Konda has omitted, and periods that others have merely sketched out are presented here in a detail that can be found in few other places. The times being what they are, the subject is (alas!) likely to remain of interest for many years to come."